The 31’ Jupiter 2003, “Changes in La Attitude,” just reduced by 30K! : Atlantic Yacht & Ship, Inc. The 31’ Jupiter 2003, known as “Changes in La Attitude,” was just reduced by 30K! She is now listed at $109,000 USD. The 31′ Jupiter is most commonly known for her fishing values. She has a 50-gallon live well in the sole and a 30-gallon stand-up live well at the transom. 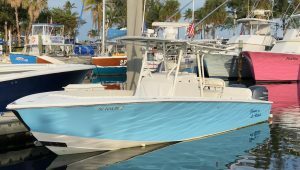 This 31’ Jupiter 2003 is equipped with 13 rod holders for the fishermen. The cockpit is plumbed with fresh water and salt water wash downs, and a small bait prep area. Furthermore, she has a new Fusion stereo, spotlite, hardtop and outriggers. As well as, an electric head and an enclosed shower/sink. This 31′ Jupiter 2003 has a Simrad depth, radar and plotter along with a Garmin Plotter and Depth with a Big Transducer of 2500 ft. Ghost Anti-Theft System will keep you at ease while away from your boat. She is beautifully kept with all new covers for cushions, seats and windshield glass. There are new spreader lights, blue under coaming lights and helm lite. In fact, this 31’ Jupiter 2003 comes ready to transport with a Triple Axle Trailer that has new tires! Contact Mack Carroll at Atlantic Yacht & Ship, Inc. for more information today.